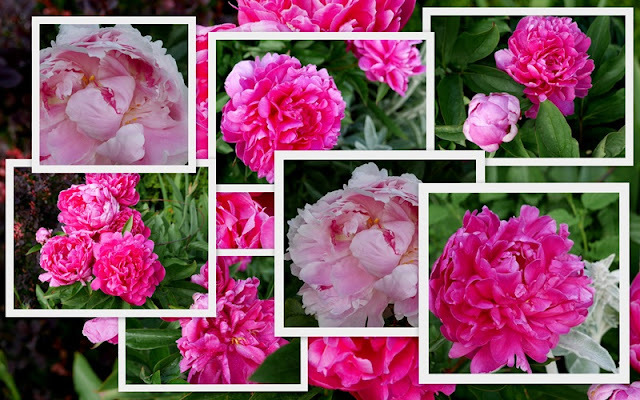 Oh, the peonies. Their season is almost over, the ruffled petals falling to the ground. We've had the driest May since record keeping began in 1937. Warmer weather than usual, too. Makes one wonder what the gardens will look like come July and August. I toy between wanting to cut them all to bring into the house to enjoy and leaving them outdoors to grace the garden with their faint perfume and gorgeous layers. The garden wins. I have three plants of the dark pink variety and one of the pale. I love the mix and hope to get more of the pale pink ones. I had a lot of fun playing with these photos, creating mosaics with Picasa and PicMonkey. With such photogenic subjects, the mosaics can't help but be pretty. 1. Happiest of Anniversaries to my parents, married May 29, 1955. 60 years of marriage is something to celebrate! We had dinner with them at the beginning of the month and today (Friday) they are going out again, this time with friends, some of whom attended their wedding. They will laugh uproariously and have a wonderful time! 2. The Little Misses each received the book Miss Rumphius for Christmas. Little Miss A decided that lupins were her favorite flower (for the time being). I noticed the lupins in bloom here, just one plant too close to the hedge. Miss A and I ventured in behind the plants to see it. When I asked her to pose close to the lupin, she hugged it. Adorable. 3. Siberian Iris - I like them much better than the bearded variety. They are not quite so messy. Pretty in a cluster. 4. Little Miss S stopped by this week. "Nana, can I draw on the tablet?" she asked. Since the tablet is new and belongs to Grandpa, Nana doesn't even know how to turn it on. So we resorted to drawing the old fashioned way. She was very agreeable to the alternate plan and got almost as much marker on her hands as onto the paper. 5. 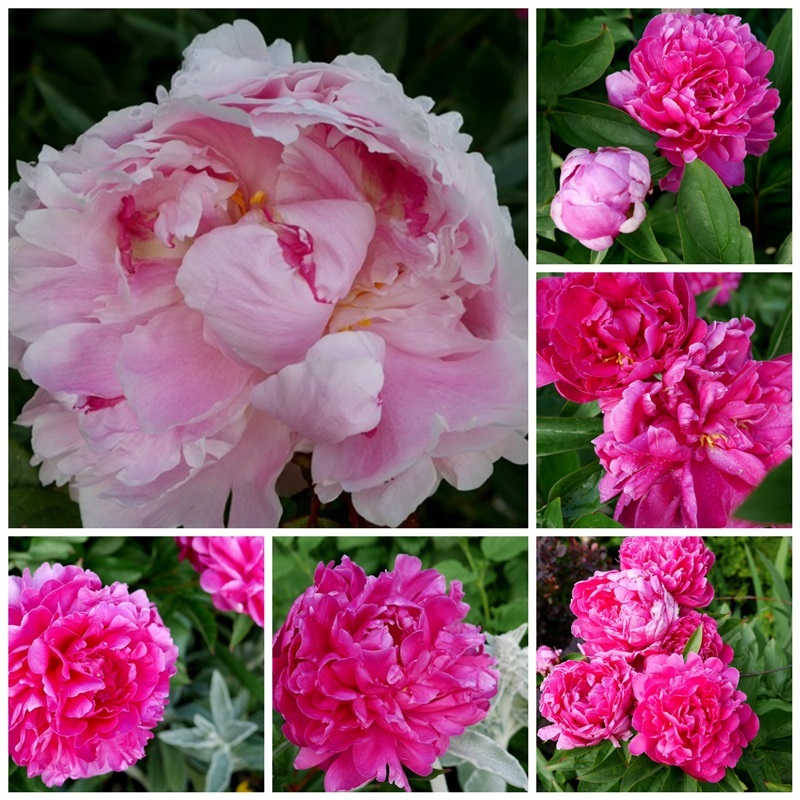 Peonies are in full bloom, gorgeous in their ruffled elegance. Transient beauties that must enjoyed in the moment, for they will not linger. Thanks for the reading suggestions offered in response to my earlier post. I'll be writing them down and exploring possibilities. Weekend road trip. Just one night away, at the beach a few hours up the road, in Parksville. 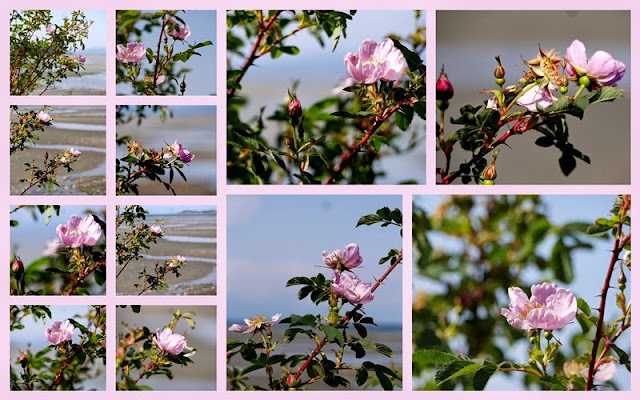 Wild roses bloom on the path from the hotel down to the beach. Beautiful forms and colors. Friends. So glad for them. We support each other through job losses, everyday problems, parental issues, aging parents, and now, one is walking through breast cancer. We talk, we laugh, we cry, we pray, we eat. Together. Sea anemone waving underwater. One slight touch and all the tendrils pull together in protection. A shell lies open on the sand. Afternoon shadows highlight its curved lines. The best treasure of all - my husband. Wide and open, this beach is full of tidal pools to explore, squishy mud between the toes, tiny crabs scurrying back and forth, and enough space that no one feels crowded. The land mass in the background is firstly Lasqueti Island, and behind it lies Texada Island. Beyond that is the mainland. Roses nod in the sunshine. Home again and another week beckons. 1. A rumble of thunder disturbed my sleep shortly after 5 this morning, followed by three more rumbles in the next 15 minutes. I dozed, content in my warm bed, then slept again after the soft dripping of rain began. Thunder is very unusual here, but I enjoy the drama of a thunderstorm and the way it refreshes the air and garden. 2. The peonies are slowly beginning to open. I was impatient at first, seeing those tight buds weeks ago, wondering how long it would take them to open. Now, I'm content to watch their slow unfolding, knowing their season will be all too short. This creamy pink one is new and there are just two buds on it. I'm quietly anticipating the delight of its blooms. 3. I took a risk and bought a mini watermelon from California this week. The risk is the taste - would it be mushy and flavorless or crisp and sweet. I'm happy to report the latter. We enjoyed it in a salad combined with olives, feta cheese, fresh mint and lime juice squeezed over all. 4. I took a meander through the garden after breakfast. The rain lasted just a short while and now the sun is breaking through the clouds. Squash is growing well and the radishes planted last weekend have sprouted. I always mix radish and carrot seed together and plant them in the same rows. The larger radish seeds help disperse the fine carrot seeds and they grow at very different rates so by the time the carrots are forming, the radishes are long gone. 5. Chives in full bloom. The flowers are good in salads, too, taken apart and sprinkled over top for a peppery bite. A question for you. I'm looking for some good reading material for the summer. Any suggestions of good books you've read? My recent reads include P.D. James The Murder Room, Vanessa Diffenbaugh's The Language of Flowers, Philip Yancy's The Jesus I Never Knew, and I'm still engrossed in Far From the Madding Crowd by Thomas Hardy. I'd love to know what you're reading and what you might suggest. First off, you'll have to look beyond the ornate gates to see the similarities between my home and Versailles. There are no gold plated gates here. This is one of my favorite photos, taken in the Salon d'Hercule. Once again, look past the ornate. See it? There, on the window frame. Chipped paint? Wear and tear? Dirt? Mold? We've got it all. Just like Versailles. Here's where the similarity ends. Unlike the owners of Versailles who lifted nary a finger, our home is maintained by the Mr. and Mrs. Here's my brave and daring husband, up three stories on a very tall ladder, scrubbing the gutters and siding. I stayed nearby, ready to help if needed. You can see the difference. And while I waited and watched and worried, I scrubbed the deck railings. The mold and dirt are gone, but the shabby chic look is still there. A new deck railing would be nice, but it's not in the cards this year. Hey, if Versailles draws in millions with its weathered look, I think I can live with a little of it here. The clematis doesn't seem to mind. We'll call it patina. I'll add some pretty flowers, like these pots of pink geraniums and hey, ho, it's summer in Versailles - I mean Victoria. Any similarities between your home and Versailles? Tis the season of home maintenance. Should we send a memo to France? Victoria Day originated in the early 20th century as a way to honor Queen Victoria's birthday. The date varies, but it's always a long weekend to anticipate as the start of summer. Barbecues, parades, and gardening are typical activities. 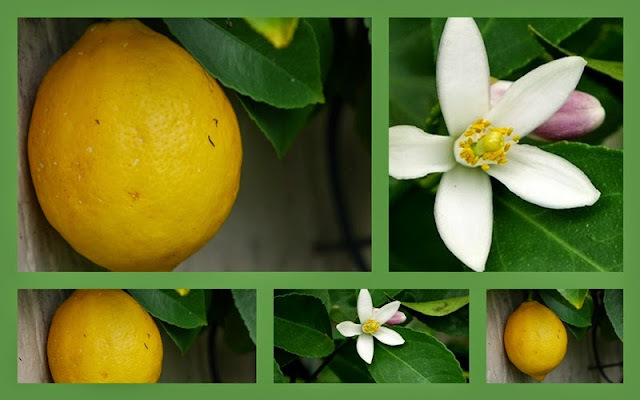 We uncovered the lemon tree for the summer and found more ripe lemons to harvest as well as blossoms promising lemons for later. The irises are blooming. They are so pretty when they begin blooming, but if it rains they tend to fall right over. Dry days are in the forecast so I hope they stay upright for as long as the blooms last. Strawberries are ripening - much earlier than usual. I picked a handful this evening and tossed them into a salad of greens and avocado. Yummy. The first Secret Rose is blooming. I love the darker pink stain on the petals and its wonderful fragrance - sweet and fruity - faintly evocative of apples. There's been no rain - this photo was taken after the watering system was activated for the first time this season. Linking with Mosaic Monday, hosted by Judith of Lavender Cottage Gardening. Apparently, serving individual desserts in mason jars is "hipster." Don't believe me? Just Google "hipster mason jar" and you'll end up with more ideas than a chicken has feathers. Hipster it may be, but these made cute desserts for our Mother's Day picnic last Sunday. A ginger cookie oatmeal crust, topped with an unbaked cheesecake mixture, topped with a raspberry blueberry sauce, a dab of whipped cream and a fresh mint leaf tasted mighty fine. The grand girlies at the picnic obediently saying "cheese." And the grand boyo enjoying a cheezie while seated on the grass. These little ones are all so good about wearing hats to protect their eyes and skin. I'm not teaching full time any more, but I did work 3 days this week. I've been sewing more and recently finished the above dress. It swishes. I do love a swishy dress. And it twirls. So much fun. What I'm reading. Walking on Water is a re-read, a book to pick up, read a few pages and then think a lot. The Language of Flowers I'm just beginning. Far From the Madding Crowd is on the list because I saw a preview of the movie and I like to read the book before the movie rather than the other way around. I hope it's a happier tale than one of Thomas Hardy's other novels - Tess of the D'Urbervilles. If you love vegetables, as I do, Plenty More will make you drool. Such inventive deliciousness. I'm still at the marking stage, not the cooking stage, but I'll get there. Yum! That's what's been happening here. How about around your place? Are you reading, sewing, cooking anything you'd like to share? Our back fence neighbours (whom we never see) have a wisteria trailing along the fence that adjoins our property. We planted a hedge and they re-contoured their yard so neither of us can see the wisteria. However, last year, a single vine peeked through the hedge. I encouraged it. This year, the single vine brought a friend. A wisteria party is in the making. Tim is carefully training the vines to grow along the newly finished garden shed. Yesterday was hot and sunny - a great day for drying paint. So we painted the shed. Tim took the vines down and gently replaced them when we were finished. 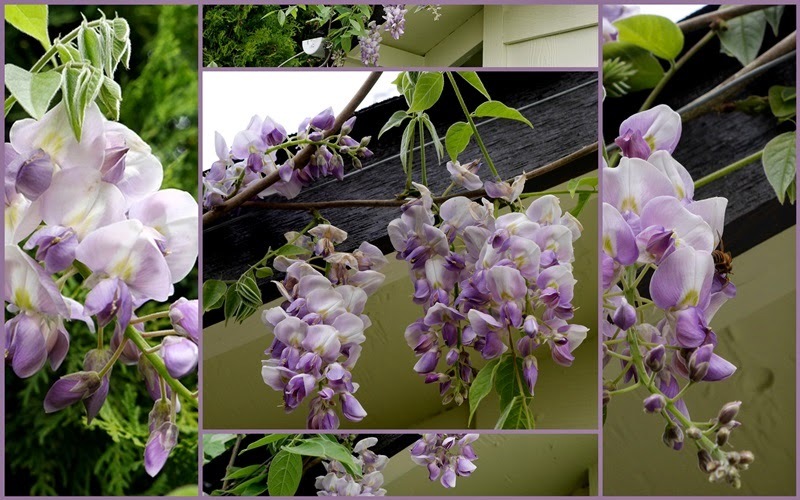 Wisteria conjurs up the Deep South in my mind - perhaps I've read too many novels where wisteria trails along covered porches occupied by tea or mint julep drinking occupants. It's delicately scented and so pretty with its hanging clusters of flowers. I hope the vines like their perch so much that they bring along more friends next year! Linking (on Monday morning) to Mosaic Monday, hosted by Judith of Lavender Cottage Garden. What do the flowers say? Early on a Sunday morning in May, a small boy climbs the hill behind his house. His mission: to collect a bouquet of bluebells for his mother. The small boy grew to be a young man and every year he gathered bluebells for his mother on Mother's Day. That young man became my son-in-law. This custom of his has always touched me. The bluebells are long gone this year, as are the daffodils and tulips. 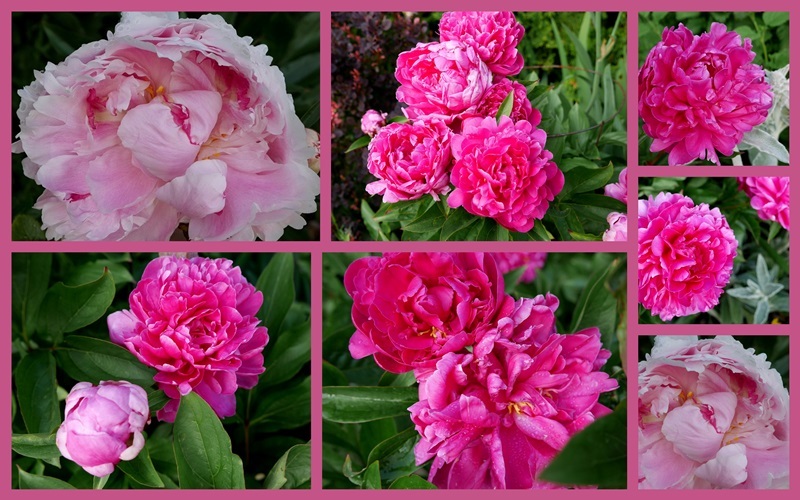 Lilacs are on the wane and the first peony is opening in my garden. The hydrangea bush received 12 years ago on my first Mother's Day back in Canada is forming tight buds, but it will be awhile before it blooms. Still there will be flowers for Mother's Day, whether gathered in the wild, picked from a garden, purchased at a florist shop, or sent virtually in a card or email. What do the flowers say? I love you. You are precious to me. I value your role in my life. You gave me life and taught me how to live. For some, becoming a mother was easy, for others an arduous process of years of hope, tears, and longing. For some, the longing is never fulfilled. My daughter wrote eloquently about her own mothering journey and at the end of her post urges kindness in the midst of celebration. I can only echo her words, as I, too, struggled with becoming a mother. Celebration. Love. Thoughtfulness. Gratitude. Kindness. Good concepts that mothers teach their children. Let's not forget the lessons. Give flowers that speak without words, deep from the heart. The mostly empty garden beds are calling out to me - "it's time to plant." While preparing the beds for seeds the other day I picked a bunch of Swiss Chard and 5 asparagus stalks for dinner. Asparagus takes a very long time to establish. And then the stalks appear overnight and if I don't cut them right away they stretch upwards into long, gangly things that are too tough to eat. The remedy: spend more time in the garden. I intend to do that. We came home from our weekend to see the front bush covered in pink roses. So early. So pretty. This is a mongrel rosebush, of unknown heritage. It's a prolific bloomer. The Weigela is frothy with pink blooms and variegated leaves. The man of the house commented this morning on the preponderance of pink in the front garden just now. An easy dessert. A bit of butter and brown sugar melted together, add some orange slices/sections and orange juice, bring to a simmer, add a sliced banana or two, a teaspoon of vanilla and sprinkle with cinnamon. Really easy. Good over ice cream, if there's some in the freezer, which there was not, and that was fine by me, the one who shrugs at ice cream. More pink. Maybe the front yard does look like a Sweet Sixteen party. There's barely a leaf visible on the rhododendron. One more exam to invigilate (for my American readers, that's proctor) next week. Three done for this week. It's mind-numbing. I make up stories and poems in my head, recite verses, come up with recipes, and so on, all the while keeping my eye on the clock so as to give the correct direction at the correct time. Today, however, I'm spending some time helping our daughter paint Miss S's new bedroom. Wishing you a glorious May day! The suitcases were beside the door. I came home from school, dropped off my bag and away we went, hoping to catch the 4 pm ferry to Vancouver. Success! I brought my camera along, but didn't use it once. I did use my I phone so the photo quality is not that great. We spent the evening with Owen and Ashley. Vancouver is a beautiful city. In the above photo, Science World's dome looks like a huge moon against the north shore mountains. Here's the real moon, almost full, shining down on the endless construction scenes in this city that never stops growing. Real estate is about $1,000.00 per square foot so I don't know how anyone starting out can afford to buy a home. My three walking companions and I walked first to Peaceful Restaurant for the best Chinese food (northern China) that I've ever had. A bit spicy and everything freshly made in house. Delicious! We wandered around False Creek for awhile, then headed over to Earnest Ice Cream. At 9 pm on a cool spring evening with a chilly wind blowing in from the water the lineup went out the door. I'm not very much a fan of ice cream, but I indulged in a Caramel Corn Sundae - buttery sweet ice cream, rich salted caramel sauce, whipped cream and a sprinkling of fresh caramel popcorn. Truly an indulgence and worth it! Saturday afternoon we were in Chilliwack, about 1.5 hours from Vancouver, for a very special dinner with my parents and siblings. The beautiful couple above are celebrating 60 years of marriage this month. There will be a bigger family gathering in July. This dinner marks the start of what I hope will be many celebrations to mark this event. I'm so thankful for my parents' love for God, for each other, and for their children, grandchildren, and great grandchildren. They are wonderful!